Stephen Covey tells the story in First Things First of attending a seminar, in which the instructor pulled out a wide-mouth gallon jar. He sat it on the table next to some fist-sized rocks. 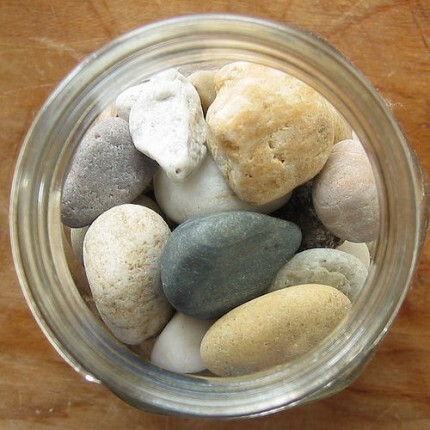 “How many of these rocks do you think we can get in the jar?” he asked. The students made various guesses. The instructor then proceeded to fill the jar with the rocks. It looked like it was full. He asked the class, “Is this jar full?” Everyone looked at the jar and agreed that it was indeed full. He then reached under the table and pulled out a bucket of gravel. He then dumped the gravel into the jar. The gravel went in between all the little places left by the big rocks. Then he grinned and once more asked, “Is the jar full?” By this time, the class was on to him. “Probably not,” several of the students said. I would make an additional point. The big rocks are a metaphor for the important stuff. If you don’t make room for the important stuff, it will be overwhelmed by the less important stuff. With this in mind, I decided last week that I wanted to plan out the next three years. I am not talking about all the little details. My life is too dynamic for that to work. But I wanted to make sure that I scheduled the most important things, so that I wasn’t overwhelmed by the urgent. I decided I would “put the big rocks” into my calendar for the next three years. Unfortunately, I didn’t have a good tool to do this with. What I really wanted to see was the whole year at a glance. Unfortunately, Entourage for Mac doesn’t offer this kind of view. The most you can see is a one-month view. The same is true of Outlook for Windows. So, I created an Annual Time Block Tool in Excel. I have included my own calendar as an example with a blank sheet, which you can copy. You can enter the year you want to schedule in cell A5, and the calendar will automatically recalculate. It even takes into account leap years. Your list may differ. The issue is to grab the dates while you can before someone else does. Frankly, I would rather have other people plan around my priorities than be forced to plan around theirs. Remember: if you don’t have a plan for your life, someone else does. The key is balance. Make sure you schedule time for the things that are important to you. If you don’t, you will find yourself scrambling to find time for the things that are important. If you are not careful, you will wake up one day and discover that you have spent your life living for other people’s priorities.